Our gardens are so much more than a place to mow the lawn on Sunday or weed the borders once a fortnight. Entertaining in the garden has taken off dramatically over the last decade. From the humble beginnings of taking tea on the lawn, we now invite friends around for an al fresco main meal. Some of us are even holding sophisticated dinner parties to impress our prospective clients or employers. Clearly, the garden has become an important entertainment area in our homes. 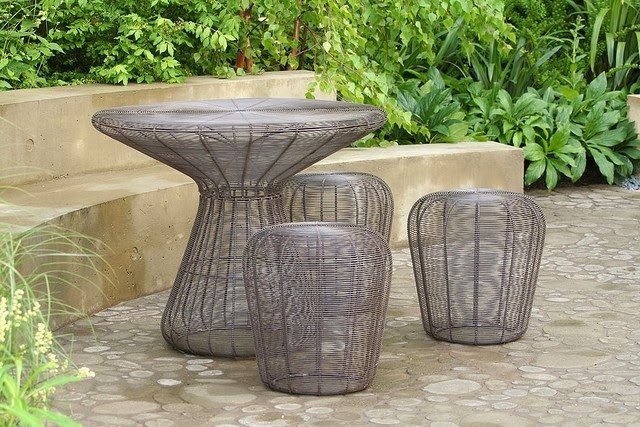 We need more than plastic furniture sets on the lawn in today's standard of home entertaining. Here are a few suggestions to consider in creating your very own entertainment area right in your back garden. 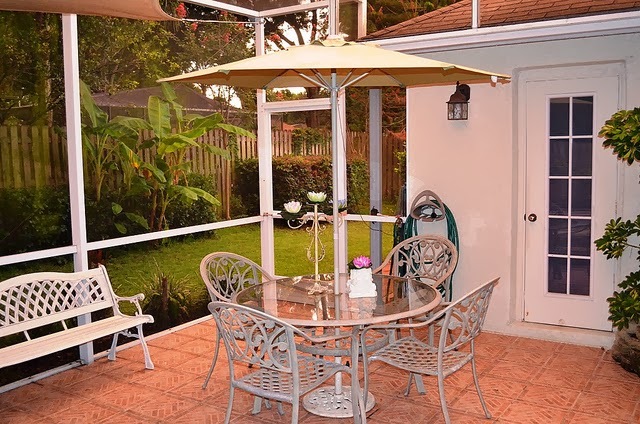 The patio is an ideal place to start when determining where to hold an important event at home. The location needs to be as draught free as possible so it is best to make sure that fencing panels are in good condition. Replace them as necessary. Traditionally, the patio is attached to the house but this not need be the case. If there is a little suntrap in the garden, it may well be preferable to locate there. The patio in the image is made from a warm looking terracotta. You may choose flagstones, stone, decking or even concrete. Decking is probably the easiest and quickest construction method for your patio area. 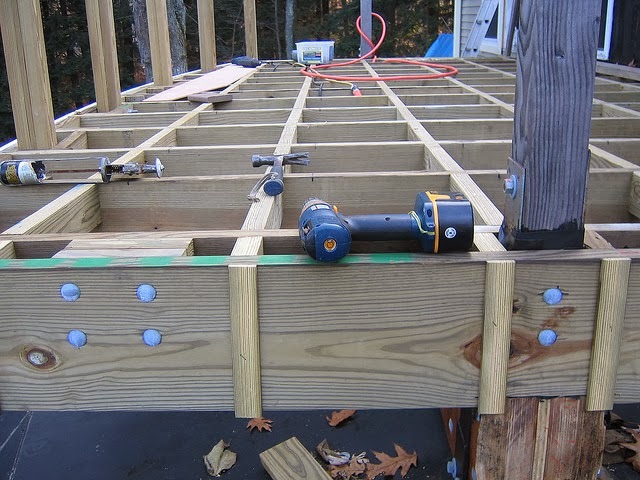 It involves constructing a wooden framework onto which the boards are fixed. Finish off with handrails, and you have an impressive patio for home entertainment. Cocktails are a must for any sophisticated get together, be they alcoholic or not. A bar can be easily constructed from timber, brick or stone. You may wish to design a tiki hut style bar for those Hawaiian evenings or maybe a 1960’s living room bar is more your thing. Having a selection of beverages professionally arranged and on tap is sure to impress. Use lighting to display the colours in the bottles. As with the bar, it is fairly simple to construct your own barbeque using a kit from your local DIY shop. All you need to add is the brick, or blockwork. Alternatively, the shops are full of high-tech gas monsters that include gas burners and rotisseries. They may be a little bit over the top sometimes so choose the one which you are more comfortable with. Furniture can be very expensive so you will have to have deeper pockets than usual. Would you opt for a modern design as in the image below, or will you stick with the more traditional designs? Buying cheap means you will end up buying again in a couple of years. Make a statement with your furniture and get the best you can. A set for six people is recommended as a starting point unless you have a very large area to fill. Outdoor speakers are readily available now so music can be piped out to you in the garden. It is also possible to have a television out there, but this comes under some strict electrical regulations so don’t attempt this yourself. Call in the experts. There is a low voltage lighting solution available for every situation in your garden nowadays. You will find fittings to light your bar, fittings that can be recessed into the floor, or overhead fittings. The list is endless. Different mixtures of colours and lighting can create varied moods. You can even use disco lighting to operate along with the music. Use a piece of art such as a statue to create a talking point. Search on the internet to find a unique piece you can afford. You can also buy or build a bespoke water feature that can be included when designing your lighting scheme. People are always impressed with a unique water feature. Hopefully, the above ideas have given you a good base from which to begin designing your own fantastic entertainment area in your garden. The best thing is that you can be as wild or outlandish as your imagination extends or your budget allows. Whether your design is traditional or modern, you will have great fun completing it and hosting parties to show it off. So get outside early and start work before the summer arrives. It would be a shame not to have your garden ready for the party season.